An Underground basement was excavated with the use of rocksaws to eliminate any vibration to neighbouring Houses. 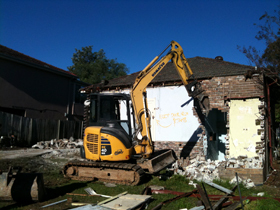 House Demolition to prepare for brand new house. 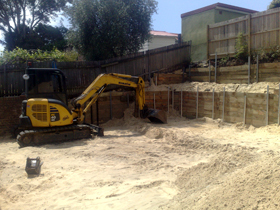 Bulk excavation including shoring system to protect existing driveway. Detailed multi level footing system. 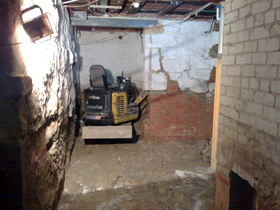 Lawrence Civil Constructions were required to excavate an entire floor level underneath the existing building, underpinning all walls as excavation proceeded. Sand excavation including shoring system. 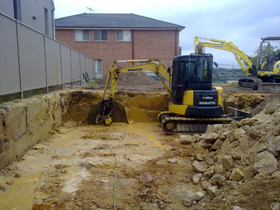 Excavation for major house extension and water tank installation. With no access, machinery was craned in and all excavated was carried out on conveyors.